Lanier National Speedway (now called Lanier Raceplex), located across from the Road Atlanta Sports Car Course, hosted the NASCAR Busch Grand National Series from 1988 through 1992, the ARCA Racing Series in 2005 and the NASCAR Whelen Southern Modified Tour in 2008 and 2009. 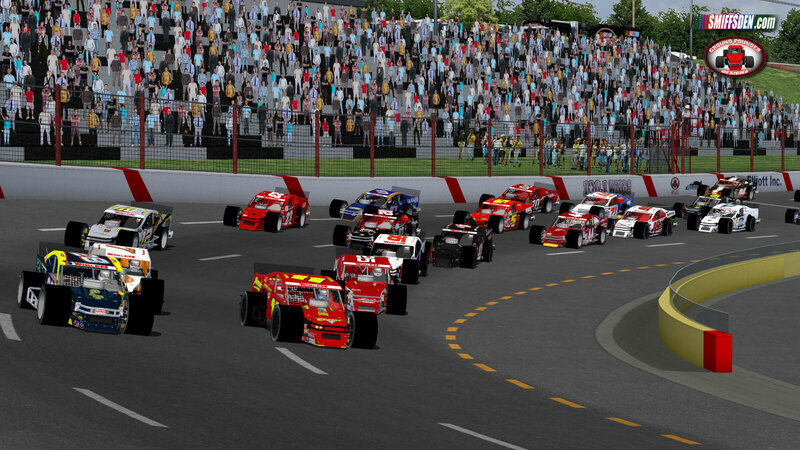 Before the track ceased operations in 2011, it ran under the NASCAR Whelen All-American Series banner and featured Super Late Models, SuperTrucks, Outlaw Late Models, Mini Stocks, Legend and Bandolaro cars as well as other divisions for it's weekly racing program. 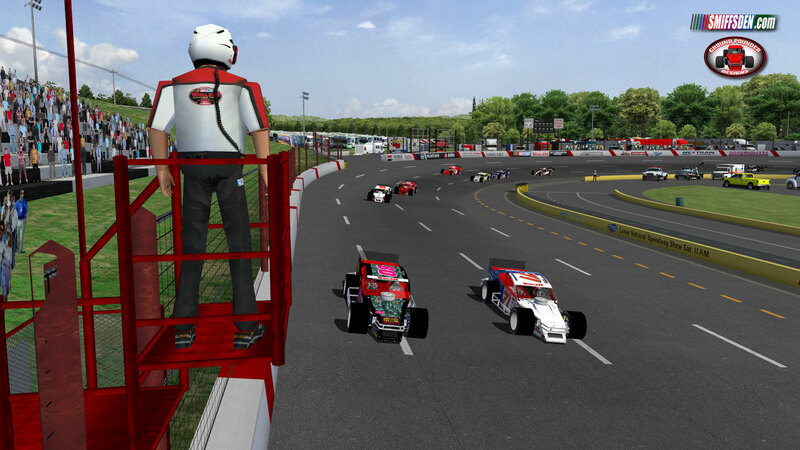 In early 2014, Jim Downing, the creator of the HANS Device, purchased Lanier National Speedway. Downing, a five-time IMSA driving champion, indicated that he has no plans to bring stock car racing back to the three-eighths-mile oval and does not plan to begin development of the track until much later in the year. With the help of Charli Brown who took hundreds of photos of the complex before it closed, we have been able to create a track and surrounding scenery that closely resemble the place as it appeared in 2011, it's final year of operation as a NASCAR track. It is not, however, an exact replica nor do the limits of NR2003 allow it to be. 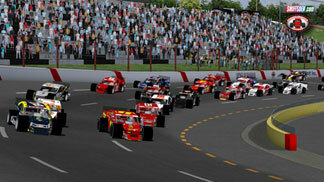 We had to modify the pit lane to comply with NR2003 game limitations and the maximum number of starters is 30. 1. Variable Banking. 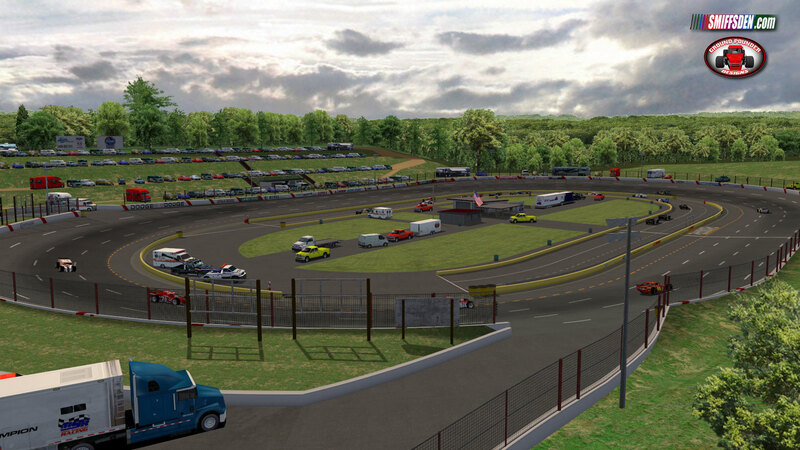 This track features real variable banking allowing for 3 distinct racing groves just like the real Lanier National Speedway, so race 'em low or race 'em high. The AI will go 3-wide (and occasionally 4-wide) to provide an exceptional and exhilarating offline racing experience. However, passing on this track is pretty difficult. An AI car beside you (either on your outside or inside) will put up a great fight for several laps and will not relinquish the spot easily...if at all. 2. Caution Pacing and Pitting. This track was constructed under "Butter's Rule" to make it capable to run with AI. However, because of the size of this track at .375 mi., it pushes the NR2003 simulation to beyond the limits of what it was originally intended. Due to the tight confines of pit entrance, there will be occasions where there will be wrecks by the A.I. when entering the pits in turn 4. 3. Pit Stops. We have intentionally set the caution pace speed very slow at 35 mph. Routine 4-tire and gas pit stops can be made without losing a lap. However in some instances, depending on where you are in the running order and how close behind the pace car you are during the caution laps, you may not have enough time to complete a full 4-tire stop with gas and still remain on the lead lap. So plan your pit work accordingly. 4. Realiging After A Caution. As is the case with most short tracks under 0.5 mi. in length, the A.I. can get confused as to where they belong in the restart lineup and it may take a few laps for them to get sorted out and re-aligned properly. Sometimes, the game will wave off the re-start and other times it'll just throw the green flag even if the field has not closed up properly so be ready to go at all times. 5. It is highly recommended that this track ONLY be run with "Pit Stop Frequency" set at 1X. Higher Pit Stop Frequency" settings of 2X, 3X or 4X will introduce problems, cause confusion with the AI and should not ever be used. 6. 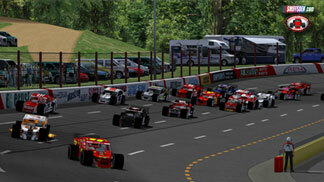 AI cars will often stack up and wreck upon entering the pits at the conclusion of races. 7. 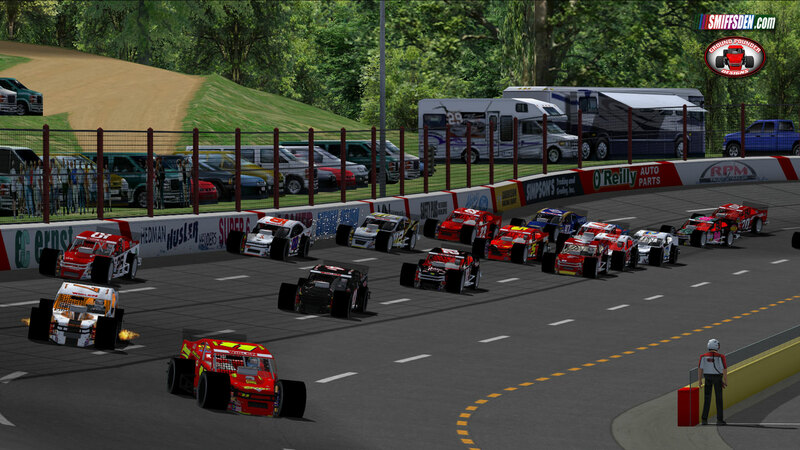 AI cars will sometimes exhibit other odd behaviors that are unfortunately inherent in short tracks made for NR2003. 8. A slow draw-in of trees and some objects is observed in the rear view mirror. c. The opponent strength set at 97%. d. Ratings for the car sets used in testing and in developing the A.I. 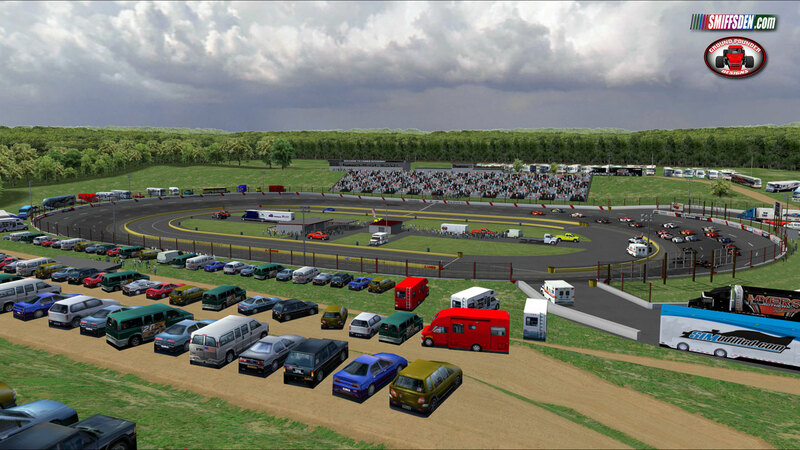 for this track are from the NRatings program using the MasGrafx Full Season V3.1 formulas. We went to great efforts to make the A.I. and racing as realistic as possible. At the same time, we also took some liberties with the A.I. tools available in the track.ini to enhance the "fun" factor. We're confident that you'll enjoy the offline racing experience against the A.I. the way we have set them up for you. 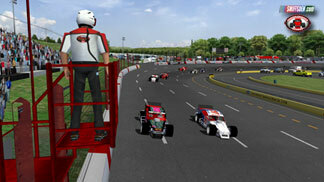 The track grip has been set to resemble the speeds and laptimes of the Whelen Modified Tour cars. To enjoy the best results, we recommend that you use the default fast setups provided with the track and car sets containing ratings as described above. Your results and A.I. behavior, however, may vary depending on the type of mod used, the ratings of your specific car set, different setups used, driving style, skill level and countless other variables that make it practically impossible to predict the results that you will achieve while racing on this track. 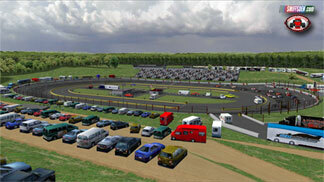 We hope that you will enjoy the racing at this track as much as we have building and bringing it to you. The track also includes our first attempt at reworking the NASCAR officials and their actions. 1. Ian Smythe: Original base track layout done with Butter's Principle, graphic detailing and immersion, custom 3do object modeling and textures, Lps, etc. 2. J.R. Franklin: AI (Artificial Intelligence, i.e. the computer controlled cars), surface grip level, graphic detailing and immersion, texturing, quality assurance, testing and general assistance. 4. Wayne "Bowtie" Anderson / Mountainman: Hauler objects. 5. Ben Althen: WMT and WSMT Haulers. 7. Wayne Faircloth: Fast and Expert GNS, CTS and Cup setups. 8. Beta Testing: Ben Althen, Mike Ehresman, Matt Gilson, Will Goshen, DaveO, Aaron Maynard and Ryan Provost.